Since its foundation in 2010, the Afghanistan National Institute of Music in Kabul has been working small miracles. Its students – among them orphans, street vendors and other disadvantaged children – play both western and traditional Afghan instruments in groups which include a ground-breaking girls’ ensemble. On this album, the fruit of a remarkable collaborative project, they meet the US string sextet Cuatro Puntos. 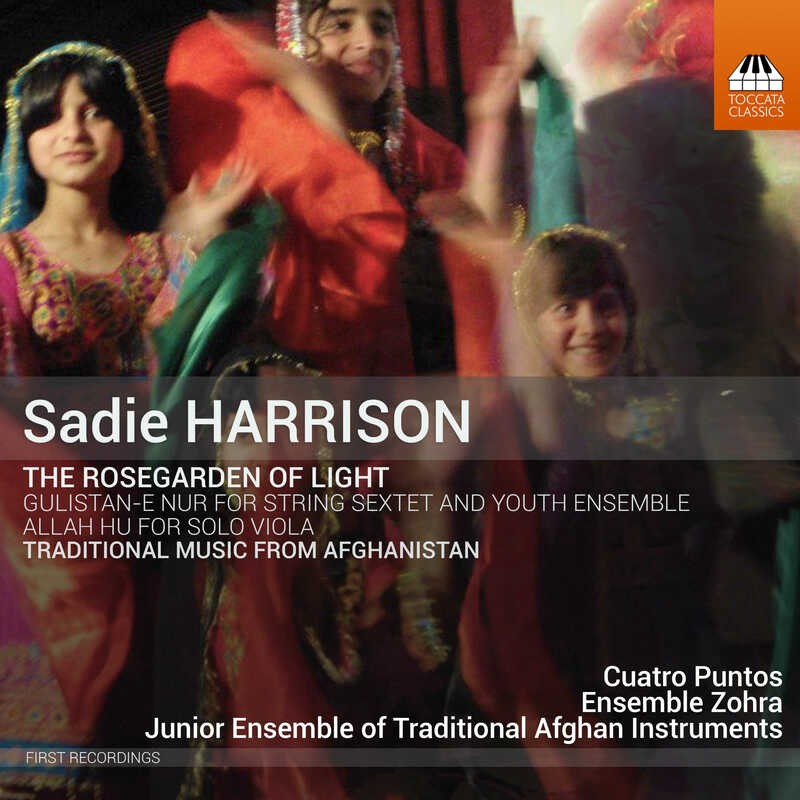 In Sadie Harrison’s Gulistan-e Nur: The Rosegarden of Light, they perform Afghan songs and dances which Harrison’s music then explores and develops. Kevin Bishop’s arrangements of Afghan tunes likewise link east and west in a visionary venture celebrating the power of music to transform lives as it also revives and rebuilds Afghan musical traditions. I came back last night from one of the dates on the ‘Rosegarden’ tour with – of course – a copy of the CD. It is – and the concert was – a fascinating listen. Utterly committed performers, some crafty arrangements by violist Kevin Bishop, and at the heart of the project the Harrison work. It alternates field recordings from the Afghanistan National Institute of Music in Kabul with responses to those pieces, played live by the American string sextet Cuatro Puntos. There was a reference in the programme to pieces being ‘culturally bilingual’, which I found helpful. The ‘Western” musicians reference the Afghan originals without patronising them, and the original material is strong enough for the themes to be clearly discernible in Harrison’s treatments. The ensemble has a double bass rather than a second cello: that makes for immense richness at times. But filigree sounds are there too. The viola solo ‘Allah-Hu’ is a gem, beautifully played by Bishop. This is music of great beauty and power, with moments of foot-tapping energy. All involved with the project are committed to the ANIM institute. The tour isn’t over – they’re worth tracking down. If it’s too late for that, get the CD and crank up the volume! Sadie Harrison is a composer of considerable stature, with a significant oeuvre that shows variety, depth and originality. She has been engaged in two additional professions which enhance her music. She’s a professional gardener, which gives her insights into the natural world and organic processes, and also an archaeologist, which opens windows into other cultures and to the past. The Rosegarden of Light project is a fascinating partnership with Cuatro Puntos (with whom Harrison is working closely, as composer in residence), a chamber music collective dedicated to global cooperation and peace, and student ensembles of the Afghanistan National Institute of Music (including the girls’ Ensemble Zohra and the Junior Ensemble of Traditional Afghan Instruments). The album’s highlight is the title work. Performed by the young women of Ensemble Zohra, the 3 Interludes that begin each section have a simple, direct charm, enhanced rather than hampered by the students’ noticeably junior performance level. The 3 Movements that follow each provide more sophisticated music, performed with bright polish by Cuatro Puntos. Listeners who know the popular Appalachian collaborations between Edgar Meyer, Mark O’Connor, and Yo-Yo Ma will appreciate and enjoy this Afghan folk flavored art music. The crepuscular harmonies of the 2nd movement are a standout. The album’s also a real toe tapper, especially the performances by the Junior Traditional Ensemble at the ANIM, dotting the program with some excellently tuneful and spirited music, like a guide leading the listener along. In a Soundhub interview on Resonance FM, Rosegarden composer Sadie Harrison sites an impulse to make her music more accessible, and this approach informs the whole album’s trajectory. You may never again find a solo for unaccompanied viola (a yearning, dark performance by Kevin Bishop) in the same company as traditional music performed by Afghan instruments (tabla, tanbur, rubab, zerbaghali, delruba, harmonium) — and enjoy them equally.